As you can imagine things have been a bit tough at the moment but you have to move on and time is the biggest healer. Alf would not want us to be sad as he was such a happy chappy, and we have learnt so much from him. Because of the situation we had to move Derwent6.. Del went up on Friday and was up early on Saturday for a early cruise after some wood had been chopped. Del went through Brownsover at Rugby and on the way noticed this piece of graffiti up on the bridge.. I know it says Fred and Alf but turn it round and put it together and you get Alfred, another sign Del thought that we were on the right path. Del passed through Newbold Tunnel.. He arrived at the marina at 1.00pm and Eric the harbour master sorted us out, and Al arrived an hour later, while friends Sarah & Erica looked after Pam (Al's Mum)..
We got some clothes together and anything else we needed from home, and said our sad goodbyes to Derwent6 for a bit..
We have been making all the arrangements for a good send off for Alf, but bless him, he has made things so much easier, even with a file on his computer headed "WHAT TO DO WHEN THE TIME COMES" it also showed the location of a hidden folder with all the information we needed for pensions, banking and funeral arrangements and most important of all the Will and power of attorney documentation, like we have said he was a smart fellow. So the funeral has been arranged for Wednesday 12th November at Shoreham Village Church at 10.30am and the wake will be at his favourite Shoreham pub Ye Olde George Inn (opposite the church). He will be cremated at Vinters Park, Maidstone at 3.30pm. 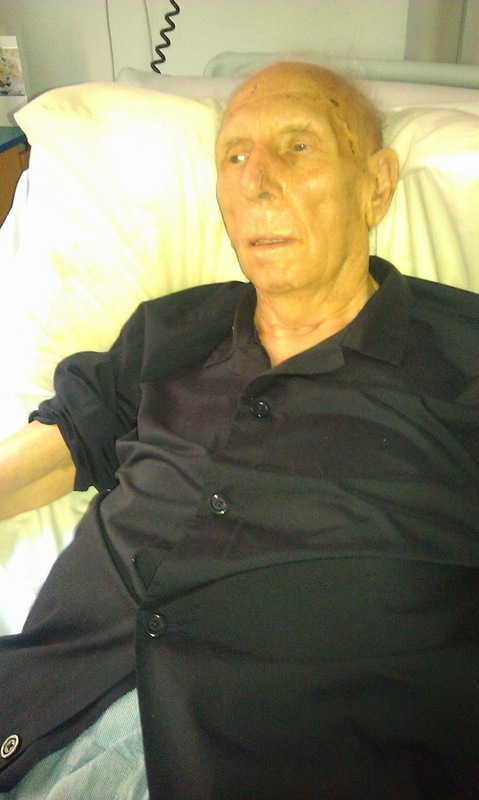 We still have a lot of work to do to make sure he gets his last wishes..... and we will make sure he does! Wow...... thanks for all your lovely comments at this very difficult time... It's at times like this that you realise that you need people round you. We are so lucky to have some of the greatest friends and family you can have who have just gone so far out of their way to help us.. A BIG BIG thank you to you all for your support..
As you all know, you learn friendship from your parents, and it has been a big task telling everyone of the very sad news about Dad,Alf, who had made more friends, of all generations, over the decades than you can imagine. Our priority now is Al's Mum Pam, who is missing Alf like mad and asks for him everyday.. while sleeping in her bed we heard her say "That's right! cuddle up to me!!" God Its hard!!! We need some quality time with her, before Dad, Alf, takes her back, to continue that 62 years of marriage..
A lovely tranquil move, then Panic! As you guys can tell from the blog, things are still not good with Al's Dad.. 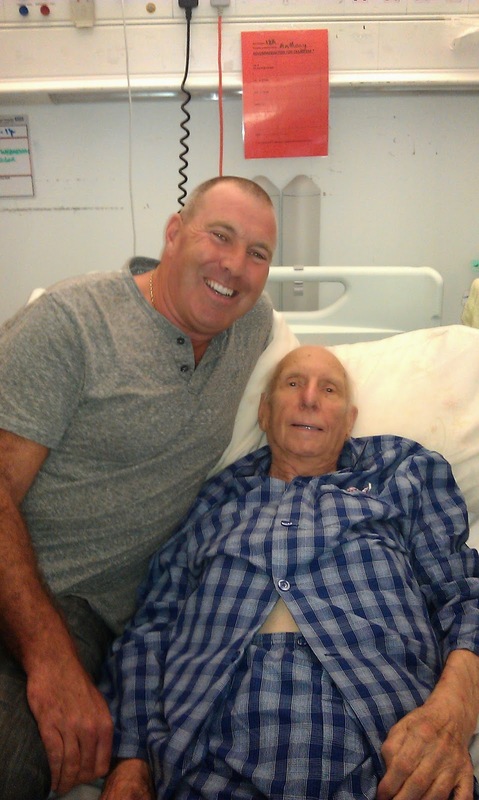 He was back home as you could see from the last blog and Al was staying with them hopefully to get Alf back on his feet. Things started to improve and Del was chatting on Skype to him from Derwent6, impressed with how well he looked. 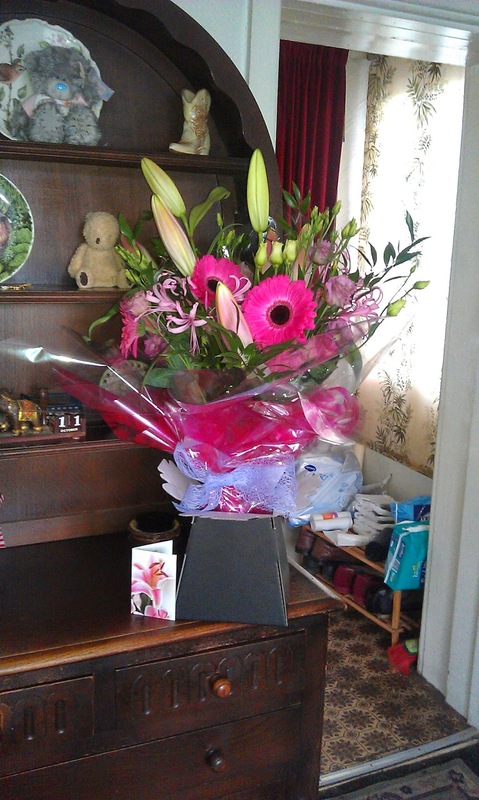 Al, Pam & Alf have received some lovely flowers from everyone including some from Sweden and they looked fantastic and brightened up the house and smelt so good.... Thank you Ingalill, that was so thoughtful. All this caring was taking it's toll on Al and she needed a break from looking after her Mum and her Dad full time, for a bit. We had to move Derwent6, because our 14 days were over due and also it would do Al so good to get back to the tranquil life on the canals. Al's sister took over looking after them for two days and Al turned up to Derwent6 on Thursday afternoon, excited from being back home. Del had already turned Derwent6 and filled with water. On that evening we went for a well earned meal out at the New Inn and a good catch up..
We decided to set off early (as Al was used that waking up at 6.00am for carers to arrive at seven) and we headed towards the tunnel..
Del stuck the bow into the portal and then rammed into reverse finding out the light didn't work. Al then panicked as Del wasn't on the stern deck and was down the gunwale pushing the sides off the tunnel walls, then burst into tears, as she thought Del had fell in, she didn't need this..
We manged to reverse out and pull over and Del got to work on the light.. It wasn't the bulb or a connection at the lamp. We had a feed at the switch, but not at the cratch board and Del found a break in the lockers and managed to do a temporary repair to get us through the tunnel. It did Al good to do the flight of locks at Braunston which took her mind off things but we had already had three calls from her sister to say that her Dad had deteriorated. Braunston was still quite busy as the weather is still very warm for the time of year.. As we pulled out of the village we got anther phone call and the doctor had to be called to Alf..
Al again was in bits and just wanted to be there so we pushed on through Hillmorton and managed to moor up at the bottom of the locks.. The next call was Alf was going in under a blue light and panic set in.. It was a quick 'grab a few things' and then we fast trotted it to the station.. We managed to get to the hospital at 7.00pm after another train and a bus and met up with Al's sister while her husband looked after Al's Mum. When we found him he looked so weak and ill again and he was diagnosed with sepsis, blood poisoning. His blood pressure had dropped into danger levels again and his pulse near the 200 mark.. We all sat by his bedside and watched the figures and the drip going into him, keeping everything crossed! We left the hospital at 1.00am with Alf showing a very slight recovery, but we all needed sleep.. On the Saturday Al was back in at 8.00am as Alf was only allowed one visiter.. Things were still 50/50, but he was stable till we could all go in at visiting time at 2.00pm. His blood pressure was going up and down like a yo-yo and his pulse fluctuated, but sill in the hundreds. So the state of play is watch this space.... Del is now back on Derwent6, on standby! Just a quick update.. Al's Dad Alf came out of hospital on Friday 3rd October but on collecting him he was complaining again of some back pain... On his discharge letter we were told some good news that the dark spots on his spine where nothing to worry about, good news at last, no one seems to want to tell us good news..
We got him home and he was with his wife Pamela again, she was so pleased to see him. 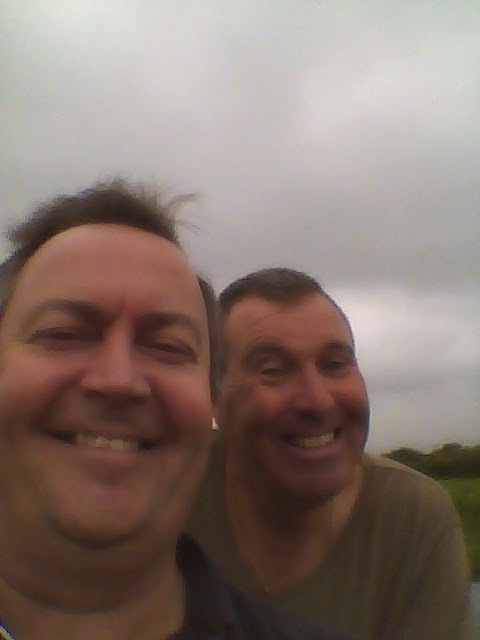 Things went from bad to worse and Al was at his bedside while Del was stuck on the river Nene.. It got to the weekend and Alf just got worse, in fact he had lost so much weight he was looking like he wouldn't make the weekend. Bernie ( Del's mate) said he would take some days off work and help Del move Derwent6 back onto the Grand Union. David, Bernie's son kindly brought Bernie up to Derwent6 and after a night in Irthlingborough they set off early..
Derwent6 was in need of a pumpout and we headed for Wellingborough but just as we got through our first lock the domestic alternator light came on, could things get any worse! Well yes they could: We stopped at the services at Wellingborough to find out the locks on the pump out had been vandalised and it was out of use so it was down to the manual pumpout fitted on Derwent6.. Bernie walked to Tesco's and Del started the pumpout to then find that wouldn't work either, Damn! so we both pushed on knowing we only had two days left in the tank and peeing in the hedge would have to be a must! So after nine locks and eighteen miles we pulled over at Cogenhoe.. 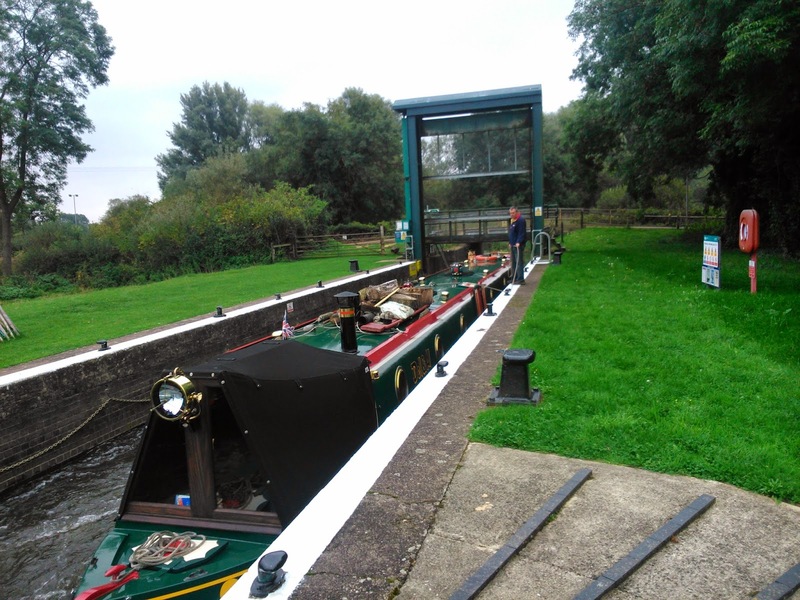 The locks are very tricky going up and you have to take things very slowly and Bernie was doing a great job.. At Cogenhoe we needed a hot meal and couldn't use any battery power due to the alternator fault. So we walked a couple of miles up to a pub in the village to then find that they had a hen night going on and no food was available, we were staving. 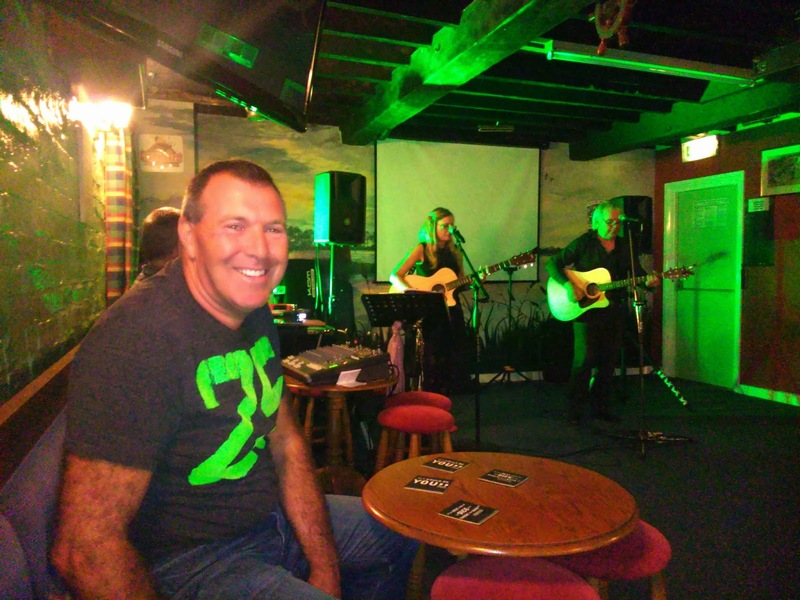 So we walked back to a small pub on the campsite where they had some hot pies which went down well with a beer and they even laid on some entertainment for us, they made us feel so welcome after we told them our story so far.. We had a great night which took our mind off things a bit.. It was another early start for us and we crept away still with the light on. We put on the generator and used the full charging setting on the inverter to put a little into the batteries. We had fifteen miles today and 24 locks.. It was Sunday morning and still very quiet on the Nene so we sneaked through Northampton with only a couple of watchers and soon got to the Northampton Arm. It was good and bad, things were easier with the single locks but the weed was so bad the Axion Prop came back into play. It was all going well until we got to lock 13 when a lock gate wouldn't open fully. We had the pole and plank out and found a boulder jamming the gate and after half an hour managed to move it enough to get the gate open and scrape Derwent6 down the gunwales. Phew! It was then the flight of twelve locks to do and luck was now with us meeting two boats coming down, the first we had seen. We then got to Gayton Marina and we were brimming on the waste tank. It was good to see the gauge showing empty as we set off to see how far we could get.. We reached Bugsbrooke and manged to get a slot right outside the pub there, we deserved it! Chilli and chips were the reward for a good days work.. We cruised early again the following day and it was strange to be passing boats every ten minutes but a relief to be on the canal system and not checking the weather.. After a few hours we got to the bottom of the Buckby flight where we had to queue for the first time this year... It made it easier with another boat but they were novices so Bernie, with full experience now, showed them how to do things and got the next lock ready for both boats.. At the top we found a mooring and gathered all our things to rush down to the hospital.. Thanks David and Bernie for all your help!! Al got to the stage where she was just watching her dad wasting away, and as she was not sleeping, trawled the Internet for some answers.. Farnborough was treating her dad as a cancer patient and doing scans and things to look for secondary cancer on his back where he had the most pain.. His weight was just falling off him and he couldn't eat or drink, it was like they had given up on him.. In desperation she found out that all his symptoms pointed to a kidney infection and thyroid problem and the next day pleaded with the doctors to do blood tests to prove her wrong.. She even showed them these two photos to show cancer couldn't do this in five weeks, they agreed. Before! They did them in front of her and when checked all hell broke lose. Alf was put on IV antibiotics and fluids and within hours you could see a recovery..
Al also had the problem of who would care for her mum, as her sister Jo also wanted to go in to see her dad. 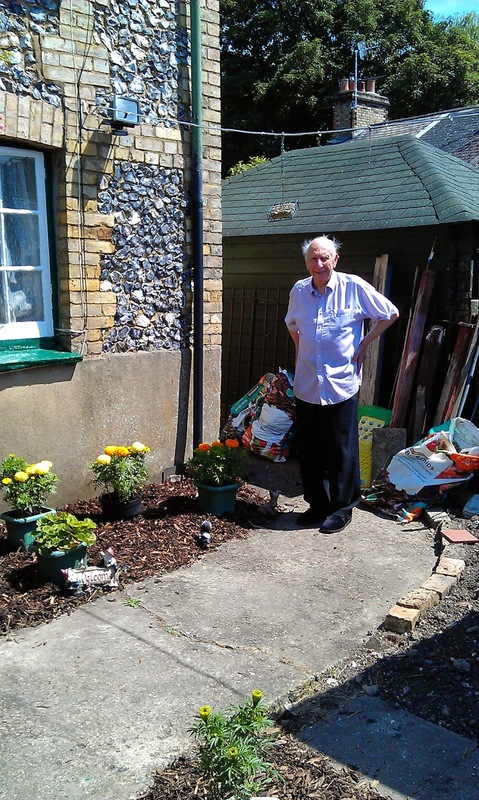 Between the two of them they managed to get in to see him and Brian (Jo's husband), neighbours and carers helped till Del managed to get back to take over.. Within days you could see Alf coming back as his weight slowly went back on his face and arms.. When an overactive thyroid was confirmed we even got a "well done you" from one of the doctors, but no one is accepting responsibility for their incorrect diagnosis. We still had the problem of Derwent6 and Del went back after a few days to sort things out..
Whilst down in Kent, Del planned to strip the domestic alternator and ordered some brushes in the hope that maybe it would solve things. The fault was intermittent with it working ok from cold for about ten minutes till the engine warmed up, and the light came back on..
Del took off the alternator and stripped and removed the brushes to find one was lower then the other, a good sign. When fitting back together he soon found out that the brush set he had was different and the earth point was a different height. After some thought, a 6mm nut was used to fill the gap and make a good connection. It worked! and Derwent6 was charging again. Then the pump out was looked at and a full service kit was fitted to the pump. As the tank was empty this can't be tested so watch this space.. So where are we!! Al is staying with her dad in hospital during the day, with carers and her sister looking after her mum, and then returning to look after her mum through the night, while Del goes backwards and forwards to Derwent6 helping out when he can.. Alf is making a miraculous recovery and we hope he will be home soon. Things have had to change at home and Al has made the changes, with Del doing the maintenance around the house and garden.. Its at moments like this you find out who your friends are and we would like to thank everyone who has phoned, offered support, visited us, and gone in to see Alf.... A big thank you to Rosemary who has been driving Del back to Kent from Derwent6.. Everybody wishes you well Alf and we can't wait for you to come home!